I successfully performed metric data aggregation in RHQ using a Cassandra back end for the first time recently. Data roll up or aggregation is done by the data purge job which is a Quartz job that runs hourly. This job is also responsible for purging old metric data as well as data from others parts of the system. The data purge job invokes a number of different stateless session EJBs (SLSBs) that do all the heavy lifting. While there is a still a lot of work that lies ahead, this is a big first step forward that is ripe for discussion. JPA and EJB are the predominant technologies used to implement and manage persistence and business logic. Those technologies however, are not really applicable to Cassandra. JPA is for relational databases and one of the central features of EJB is declarative, container-managed transactions. Cassandra is neither a relational nor a transactional data store. For the prototype, I am using server plugins to integrate Cassandra with RHQ. Server plugins are used in a number of areas in RHQ already. Pluggable alert notifcation senders is one of the best examples. A key feature of server plugins is the encapsulation made possible by the class loader isolation that is also present with agent plugins. So let's say that Hector, the Cassandra client library, requires a different version of a library that is already used by RHQ. I can safely use the version required by Hector in my plugin without compromising the RHQ server. In addition to the encapsulation, I can dynamically reload my plugin without having to restart the whole server. This can help speed up iterative development. You can define a configuration in the plugin descriptor of a server plugin. The above screenshot shows the configuration of the Cassandra plugin. 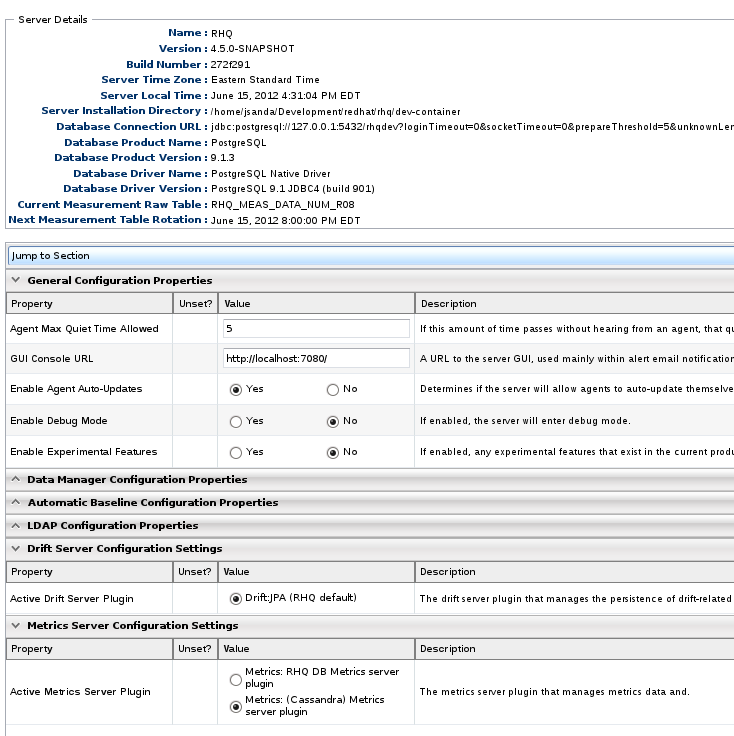 The nice thing about this is that it provides a consistent, familiar interface in the form of the configuration editor that is used extensively throughout RHQ. There is one more screenshot that I want to share. This is a screenshot of the system settings view. It provides details about the RHQ server itself like the database used, the RHQ version, and build number. There are several configurable settings, like the retention period for alerts and drift files and settings for integrating with an LDAP server for authentication. At the bottom there is a property named Active Metrics Server Plugin. There are currently two values from which to choose. The first is the default, which uses the existing RHQ database. The second is for the new Cassandra back end. The server plugin approach affords us a pluggable persistence solution that can be really useful for prototyping among other things. Pluggable persistence with server plugins is a really interesting topic in and of itself. I will have more to say on that in future post. Each row in the output reads like a tuple. The first entry is the column name with a colon delimiter. The timestamp is listed first followed by the integer code to identify the aggregate type. Next is the column value, which is the value of the aggregate calculation. Then we have a timestamp. Every column has a timestamp in Cassandra has a timestamp. It is used for conflict resolution on writes. Lastly, we have the ttl. The schema for the remaining buckets is similar the one_hour_metric_data column family so I will not list them here. The row key is the metric data column family name, e.g., one_hour_metric_data. The column name is a composite that consists of a timestamp and a schedule id. Currently the column value is an integer that is always set to zero because only the column name is needed. At some point I will likely refactor the data type of the column value to something that occupies less space. Here is a brief explanation of how the index is used. Let's start with writes. Whenever data for a schedule is written into one bucket, we update the index for the next bucket. For example, suppose data for schedule id 123 is written into the raw_metrics column family at 09:15. We will write into the "one_hour_metric_data" row of the index with a column name of 09:00:123. The timestamp in which the write occurred is rounded down to the start of the time slice of the next bucket. Further suppose that additional data for schedule 123 is written into the raw_metrics column family at times 09:20, 09:25, and 09:30. Because each of those timestamps gets rounded down to 09:00 when writing to the index, we do not wind up with any additional columns for that schedule id. This means that the index will contain at most one column per schedule for a given time slice in each row. Reads occur to determine what data if any needs to be aggregated. Each row is in the index is queried. After a column is read and the data for the corresponding schedule is aggregated into the next bucket, that column is then deleted. This index is a lot like a job queue. Reads in the existing implementation that use a relational database should be fast; however, there is still work that has to be done to determine what data if any needs to be aggregated when the data purge job runs. With the Cassandra implementation, the presence of a column in a row of the metrics_aggregates_index column family indicates that data for the corresponding schedule needs to be aggregated. I have pretty good unit test coverage, but I have only done some preliminary integration testing. So far it has been limited to manual testing. This includes inspecting values in the database via the CLI or with CQL and setting break points to inspect values. As I look to automate the integration testing, I have been giving some thought to how metric data is pushed to the server. Relying on the agent to push data to the server is sub optimal for a couple reasons. First, the agent sends measurement reports to the server once a minute. I need better control of how frequently and when data is pushed to the server. The other issue with using the agent is that it gets difficult to simulate older metric data that has been reported over a specified duration, be it an hour, a day, or a week. Simulating older data is needed for testing that data is aggregated into 6 hour and 24 hour buckets and that data is purged at appropriate times. RHQ's REST interface is a better fit for the integration testing I want to do. It already provides the ability to push metric data to the server. I may wind up extending the API, even if just for testing, to allow for kicking off the aggregation that runs during the data purge job. I can then use the REST API to query the server and verify that it returns the expected values. There is still plenty of work ahead.I have to investigate what consistency levels are most appropriate for different operations. There is a still a large portion of the metrics APIs that needs to be implemented, some of the more important ones being query operations used to render metrics graphs and tables. The data purge job is not the best approach going forward for doing the aggregation. Only a single instance of the job runs each hour, and it does not exploit any of the opportunities that exist for parallelism. Lastly and maybe most importantly, I have yet to start thinking about how to effectively manage the Cassandra cluster with RHQ. As I delve into these other areas I will continue sharing my thoughts and experiences.